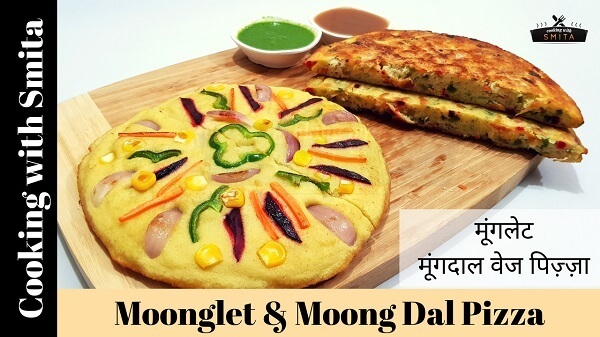 Moonglet & Moong Dal Pizza Recipe – a healthy & delicious dish made with soaked Moong Dal & Vegetables. Moonglet is a famous Delhi street food nowadays. You can also call it Vegetarian Omelette. From the same batter, I’ve also made Moong Dal Pizza. 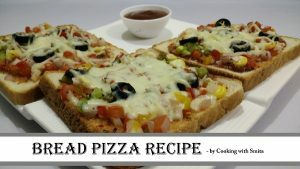 The Batter is identical for both the recipes but while making Moong Dal Pizza, vegetables are added as toppings. This vegetarian omelette is a perfect dish for breakfast and kids lunchbox. Wash and soak Yellow Moong Dal in water for 2 hours. Drain excess water from Moong dal, add Ginger, Green Chillies and Salt. Grind in the mixer grinder to make the coarsely ground batter. Divide the batter into 2 equal parts to make Moonglet from one and Moong Dal Pizza from other. Take 1 part of the batter in a bowl, add all the vegetables and Fresh Coriander, mix well. Heat a nonstick pan on medium flame, add some butter and spread. Finally, add ½ tsp. Eno or Soda in the Batter and pour the batter on the hot pan. Cover with lid and cook for 4 – 5 minutes. After 5 minutes, remove the lid, add some more butter in the pan and cook for 2 minutes without cover until the bottom of the batter becomes golden brown & crisp. After 2 minutes, apply some butter on top and flip over the Moonglet and cook for 3-4 minutes. Add some butter in the same pan and heat on medium flame. Take remaining batter in a bowl, add ½ tsp. Soda or Eno, mix well. Pour the batter into hot pan, spread evenly. Add Vegetable Toppings of your choice. Cover with lid and cook for 4 – 5 minutes on medium flame. After 5 minutes, remove the lid and apply some butter in all the corners of Pizza, cook for 2 – 3 minutes without cover. Apply some more butter on the top and flip over the Pizza. Cook for just 1 minute. Serve Moonglet and Moong Dal Pizza with Green Chutney & Sweet Tamarind Chutney or pack in kids lunchbox.